EDDM® is a low-cost way to send a mailing to a particular geographic area. You can say good-bye to the hassle of mailing lists, because with EDDM®, you select a certain area by ZIP code(s) and carrier route(s), and every address within that area will get your mailing. This popular USPS program lets you send as few as 200 mail pieces at a time to residents and businesses – or just residents – within a defined geographic zone. You can gain more insight into a specific zone by searching on age, income, or household size, although you cannot target by these factors. Your EDDM® mail pieces are addressed to “Postal Customer” and will be delivered to every door within the area you define. So you pay only for postage and printing – not for addresses and names. Your EDDM® mail pieces must be classified by the USPS as a “flat,” making self-mailers, newsletters, and large postcards ideal. It must have one dimension that’s greater than 6 1/8” high OR 10 ½” long OR ¼” thick. It cannot be more than 12” high x 15” long x ¾” thick. Eliminates the hassles of a mailing list. Forget about building, buying, or renting a list of names and addresses. 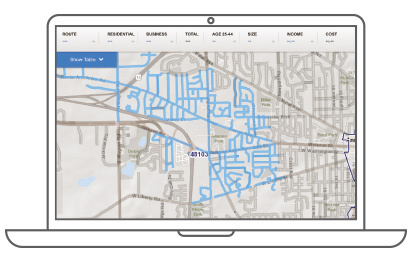 100% saturation of carrier routes within your targeted ZIP Codes. Saves you money. No mailing list, no mail permit, no addressing. Postage as low as 17¢ per piece. We make it easy for you! Print-Tech handles the printing, processing, and delivery to the post office. Print-Tech has years of experience in helping customers use this marketing tool, and we can advise you on optimum size, design, and format. We will work with you to target your ideal customers. You can add some “social marketing magic” to your mailing by incorporating social media ads. Call us or request an estimate today to get started. PS: Postal rates are going up in 2019…EDDM® is one way to save on postage!